Download "Implementing Fax over IP in your Organization"
1 Implementing Fax over IP in your Organization White Paper Open Text Fax and Document Distribution Group August 2009 Abstract Once voice systems have migrated to VoIP, fax communications are the next logical addition to an IP-based environment. 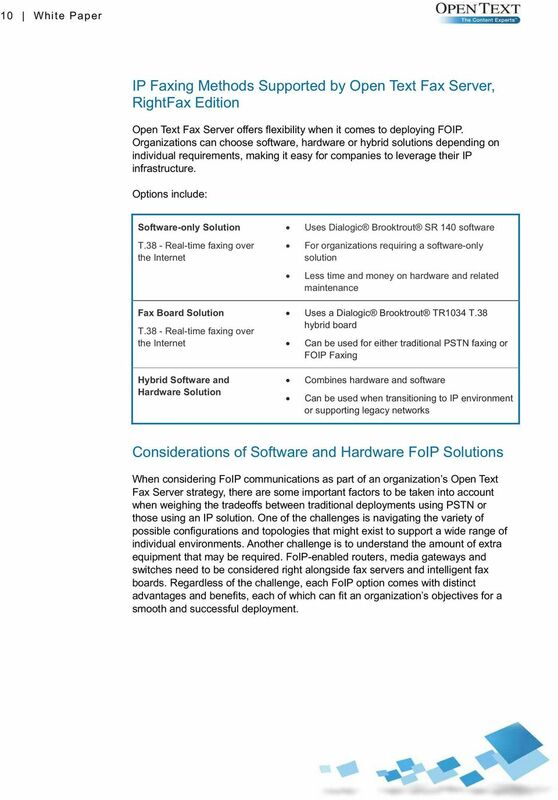 This white paper discusses how fax servers and new FoIP investments fit into an organization s overall document delivery strategy. It also calls attention to issues and challenges organizations should consider when determining how best to take advantage of traditional telephone-based systems, FoIP, or a mix of both. 3 3 White Paper Executive Summary The convergence of data and communications networks via the Internet Protocol (IP) is occurring at an ever-increasing pace as organizations look to consolidate equipment and streamline management and administration overhead. The objectives behind this consolidation are simple: To reduce IT infrastructure costs and manage all data and communication applications more efficiently. Because communication technology is quickly standardizing on IP, there is a natural overlap between those applications that already rely on a traditional circuitswitched communications backbone, and the evolving IP-based environments of the future. The challenge for organizations today is to fully understand how existing network applications, including those that are distributed over an enterprise, and can take advantage of newer IP-based approaches to data communications. Many companies which have embarked on the IP path have begun with voice communications. This is a logical starting point, since Voice over IP (VoIP) standards have been in place for many years, and many telephony systems now support VoIP. Now, as Fax over IP (FoIP) technology has matured, organizations can gain additional benefits from their network investments by consolidating their fax server system to utilize the Internet for end-to-end communications. When it comes to sending and receiving faxes on a network, the data communication from endpoint to endpoint is only part of the story. The networkbased fax server application is the true engine behind electronic document delivery because it has the intrinsic ability to act as a centralized hub for securely and cost-effectively exchanging all types of documents. It captures business documents from a variety of desktop or back office applications and then applies rules for processing, formatting, tracking and delivering outbound fax documents over a telephone system or the Internet. A fax server is also often deployed in a distributed environment to provide efficient and reliable faxing services to remote locations such as branch offices and backup sites. 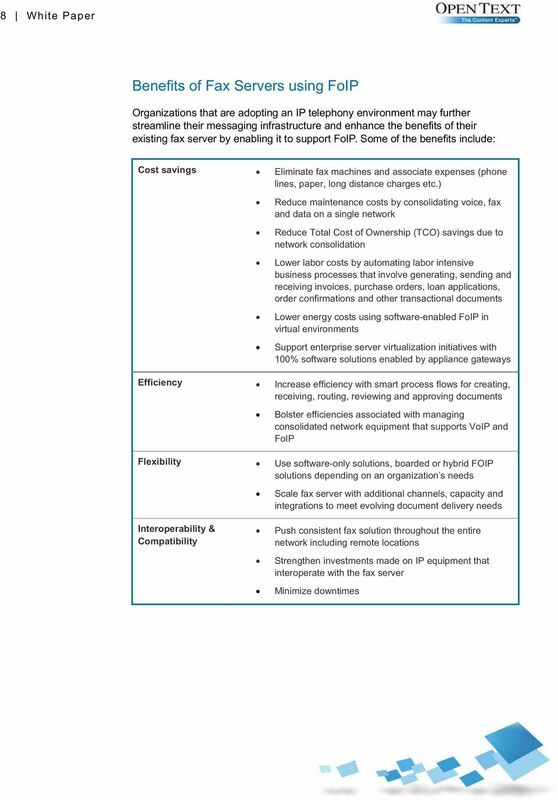 This white paper discusses how fax servers and new FoIP investments fit into an organization s overall document delivery strategy. It also calls attention to issues and challenges organizations should consider when determining how best to take advantage of traditional telephone-based systems, FoIP, or a mix of both. 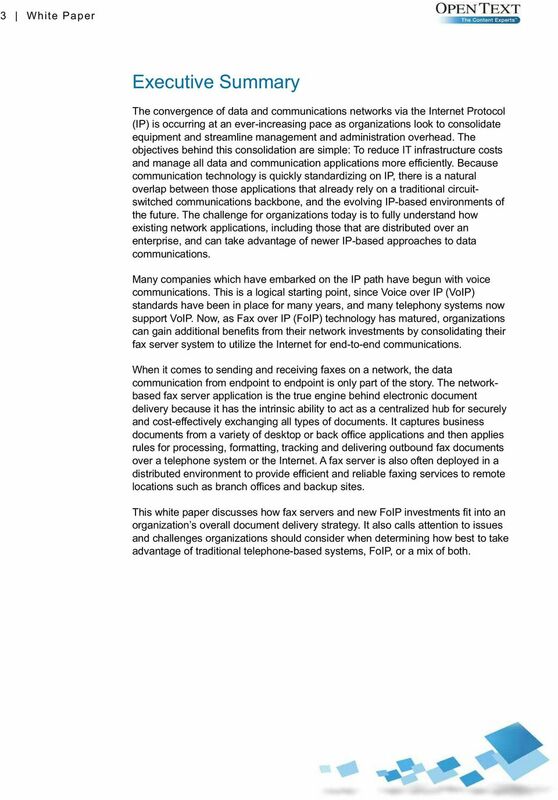 5 5 White Paper IP and Fax Converging voice with fax is not new. Organizations have benefited from the consolidation of fax with voice systems in various circuit-switched, messaging applications for many years. Traditionally, these systems have been based on the time-tested and reliable phone system and backed up by the T.30 fax protocol, which is used to establish and maintain communication between two fax devices. Furthermore, the modern day network fax server is no stranger to company LAN/WANs, using IP protocols for networking, access, and integration purposes. Remote client access, Web tools, and integration are all examples of how fax servers have leveraged the Internet for many years. Organizations that use fax servers for Web access, integration, desktop messaging, automated faxing or MFP faxing have new opportunities to migrate all or part of that environment to take advantage of FoIP. 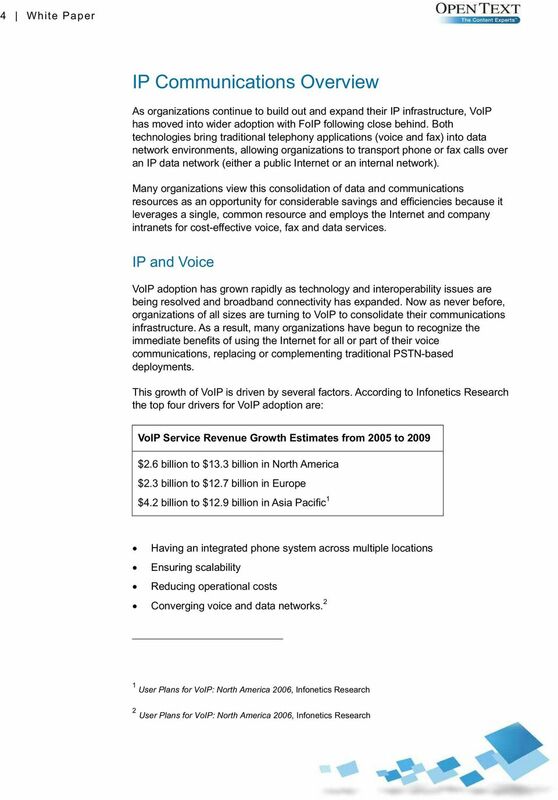 Organizations most likely to adopt FoIP include those that are: Adopting a strategy to consolidate voice/fax and data Looking for ways to reduce IT/telephony support and maintenance costs Planning to transition from analog to an all IP environment (no copper) Migrating towards virtualized environments for mission-critical applications Investing in a new Greenfield facility based on all IP Using a legacy circuit-switched messaging system that will migrate to IP Planning to reduce the total cost of ownership for their fax server FoIP Technology Overview At the core, there are three main types of telephony technologies involved with FoIP 3 : T.30 faxing over the publicly switched telephone network (PSTN). Used to establish and maintain communication between two fax devices. T.38 Real-time faxing over the Internet, delivered like a fax call. Encapsulates the T.30 protocol into T.38 data stream. T.37 Store and forward faxing using the Internet. Uses protocols like MIME or SMTP to translate faxes into s. Both the store-and-forward (T.37) and real-time (T.38) methods use the standard T.30 fax definition to recognize transferred data and to maintain compatibility with 3 Another technology, G.711, also exists but has become technically inferior to T.38 and is no longer widely used. 6 6 White Paper existing fax devices. The primary difference between these two approaches is in the method of delivery and confirmation receipts. Real-time FoIP is based on the International Telecommunications Union (ITU) standard T.38, which describes the technical features necessary to transfer facsimile documents in real-time between two standard Group 3 facsimile terminals over the Internet or other networks using IP protocols. T.38 is the preferred FoIP protocol as it aligns with the behavior of faxes over the PSTN. As with T.30, the IP fax transmission is handled like a standard fax call and an endto-end communication is established. A fax server that sends or receives faxes using T.38 looks just like any other non- FoIP fax device to its partner. The two end points establish a session, send and verify the transmission of one or more pages and then complete the session with active confirmations from both sides. The difference with a FoIP-enabled server is that the first part of the communication session from the server to the network traverses an IP network rather than traveling directly over the PSTN. If the partner device is directly addressable on the same network, the session can use T.38 for the entire transmission. But if the devices are separated by the telephone line, the IP switch manages the unwrapping of T.38 packets into standard T.30 fax transmissions over the PSTN. T.38 is the main driver of today s advancements in IP faxing and is the protocol of choice for organizations seeking to use their IP infrastructure to reap the benefits of real-time fax communications. T.38 protocol support is built into almost every leading manufacturer of IP routers, IP-PBXs or media gateways. It can be supported via a class of intelligent fax boards that can provide either T.30 PSTN or T.38 FoIP output or via the fax server software directly without using intelligent fax boards. 9 9 White Paper Open Text Fax Server, RightFax Edition and FoIP Open Text Fax Server, RightFax Edition is the proven market leader in fax server and document delivery software. It delivers the most reliable and robust fax software solutions to integrate and automate the flow of a full range of fax, paper and electronic documents and data, enabling enterprises to achieve significant cost reductions. By using Fax Server, companies can securely and efficiently deliver business information from virtually any application via fax, , print devices or over the Internet. 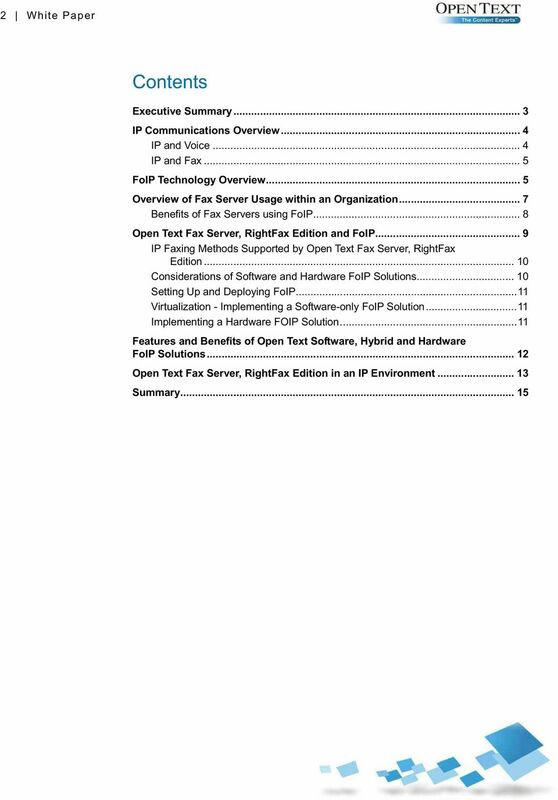 10 10 White Paper IP Faxing Methods Supported by Open Text Fax Server, RightFax Edition Open Text Fax Server offers flexibility when it comes to deploying FOIP. Organizations can choose software, hardware or hybrid solutions depending on individual requirements, making it easy for companies to leverage their IP infrastructure. Options include: Software-only Solution T.38 - Real-time faxing over the Internet Uses Dialogic Brooktrout SR 140 software For organizations requiring a software-only solution Less time and money on hardware and related maintenance Fax Board Solution T.38 - Real-time faxing over the Internet Uses a Dialogic Brooktrout TR1034 T.38 hybrid board Can be used for either traditional PSTN faxing or FOIP Faxing Hybrid Software and Hardware Solution Combines hardware and software Can be used when transitioning to IP environment or supporting legacy networks Considerations of Software and Hardware FoIP Solutions When considering FoIP communications as part of an organization s Open Text Fax Server strategy, there are some important factors to be taken into account when weighing the tradeoffs between traditional deployments using PSTN or those using an IP solution. One of the challenges is navigating the variety of possible configurations and topologies that might exist to support a wide range of individual environments. Another challenge is to understand the amount of extra equipment that may be required. FoIP-enabled routers, media gateways and switches need to be considered right alongside fax servers and intelligent fax boards. Regardless of the challenge, each FoIP option comes with distinct advantages and benefits, each of which can fit an organization s objectives for a smooth and successful deployment. 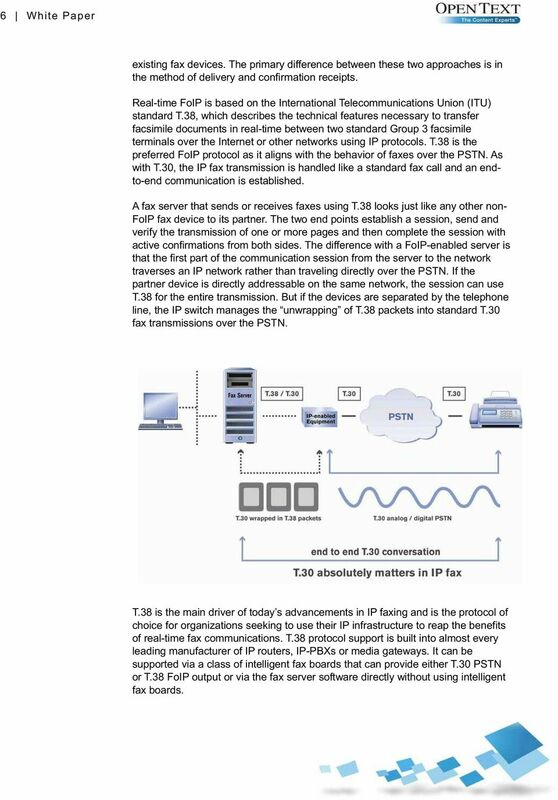 11 11 White Paper Setting Up and Deploying FoIP Open Text Fax Server uses transport service architecture (called DocTransport) to setup and deploy FoIP solutions. This DocTransport service can setup and configure software, hardware or hybrid FoIP solutions. The licensing, setup and configuration tools are built in to the DocTransport service, making FoIP easy to administer. 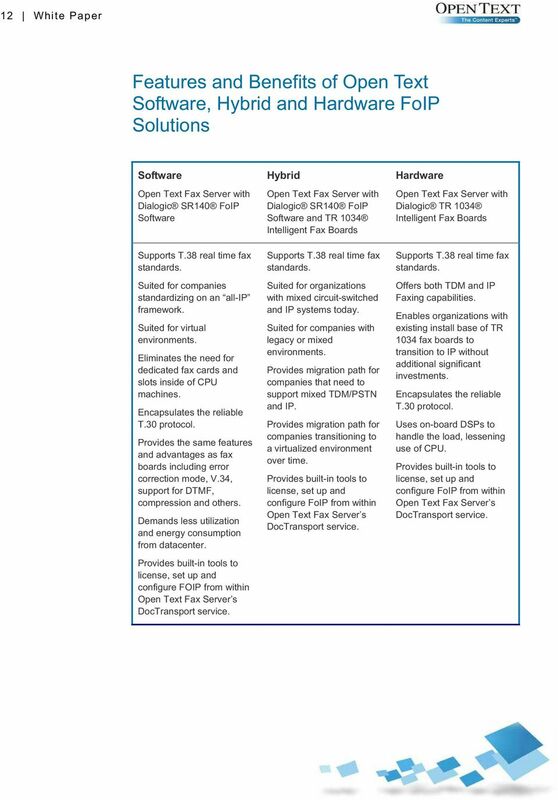 For distributed environments, Open Text Fax Server uses this transport architecture to setup either the hardware or software method to run remotely, whether a separate machine in the local datacenter or at a remote location. This can help serve redundancy schemes, load balancing, virtualization scenarios, or enable remote offices to send and receive faxes via IP. Scalability is available for both options too, with capacities ranging from 2 to 120 fax channels per server. Virtualization - Implementing a Software-only FoIP Solution Software driven FoIP solutions provide many advantages, especially for those companies with virtualization strategies or those that are standardizing on an all IP infrastructure. Open Text Fax Server uses Dialogic Brooktrout SR140 software to translate fax data from the fax server into real-time fax packets. Because it is software-based, companies can take advantage of virtualization for their Open Text Fax Server, using less server machines and leveraging existing infrastructure. In addition, because there are no fax boards, organizations can better serve green strategies for their datacenters, since less physical resources are required. Implementing a Hardware FOIP Solution Intelligent fax boards have been deployed with fax server software for many years and are considered time-tested and proven. The boards use on-board Digital Signal Processing (DSP) technology which does not burden the application server s CPU, thus leaving the majority of a server s processing power for the fax server software. Open Text Fax Server uses Dialogic Brooktrout TR1034 intelligent fax boards, capable of supporting the industry s first T.38 V.34 implementation. V.34 can double the speed and cut transmission time in half. The boards support both traditional TDM and IP configurations at a wide range of densities, making them very scalable. Many organizations today have deployed TR1034 boards in circuit-switched TDM configurations. However, because they also support IP, there is a latent opportunity to migrate the boards to IP when the need arises. This protects the investment made, and sets the stage for an IP solution for the future. Although the boards require a form factor inside a server machine, they can be setup in dedicated machines, separate from the sax server itself to offload CPU processing from the fax server. 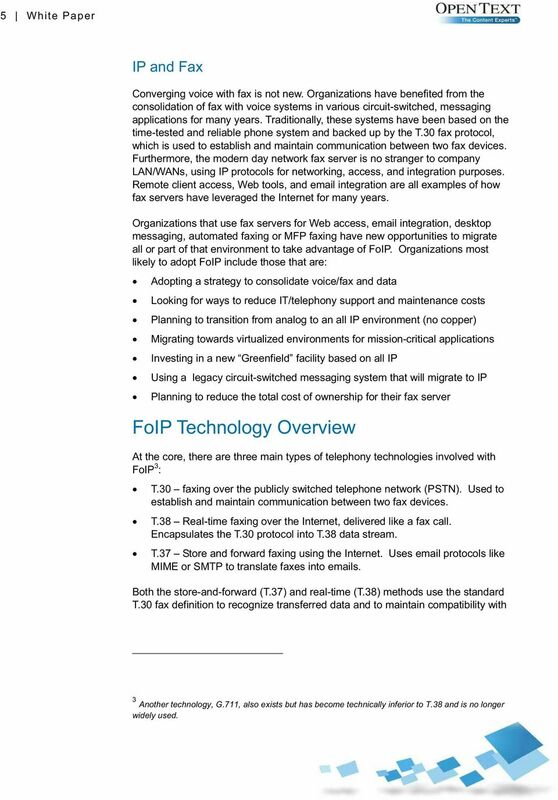 12 12 White Paper Features and Benefits of Open Text Software, Hybrid and Hardware FoIP Solutions Software Open Text Fax Server with Dialogic SR140 FoIP Software Supports T.38 real time fax standards. Suited for companies standardizing on an all-ip framework. Suited for virtual environments. Eliminates the need for dedicated fax cards and slots inside of CPU machines. Encapsulates the reliable T.30 protocol. Provides the same features and advantages as fax boards including error correction mode, V.34, support for DTMF, compression and others. Demands less utilization and energy consumption from datacenter. Provides built-in tools to license, set up and configure FOIP from within Open Text Fax Server s DocTransport service. Hybrid Open Text Fax Server with Dialogic SR140 FoIP Software and TR 1034 Intelligent Fax Boards Supports T.38 real time fax standards. Suited for organizations with mixed circuit-switched and IP systems today. Suited for companies with legacy or mixed environments. Provides migration path for companies that need to support mixed TDM/PSTN and IP. Provides migration path for companies transitioning to a virtualized environment over time. Provides built-in tools to license, set up and configure FoIP from within Open Text Fax Server s DocTransport service. Hardware Open Text Fax Server with Dialogic TR 1034 Intelligent Fax Boards Supports T.38 real time fax standards. Offers both TDM and IP Faxing capabilities. Enables organizations with existing install base of TR 1034 fax boards to transition to IP without additional significant investments. Encapsulates the reliable T.30 protocol. Uses on-board DSPs to handle the load, lessening use of CPU. Provides built-in tools to license, set up and configure FoIP from within Open Text Fax Server s DocTransport service. 13 13 White Paper Open Text Fax Server, RightFax Edition in an IP Environment Open Text Fax Server was designed as a flexible centralized document delivery hub which can support FoIP, traditional PSTN or both. Open Text is committed to ongoing research and development and has developed longstanding partnerships with leading hardware and software vendors to ensure the application provides the most reliable, robust and adaptable solution for companies transitioning to FoIP. 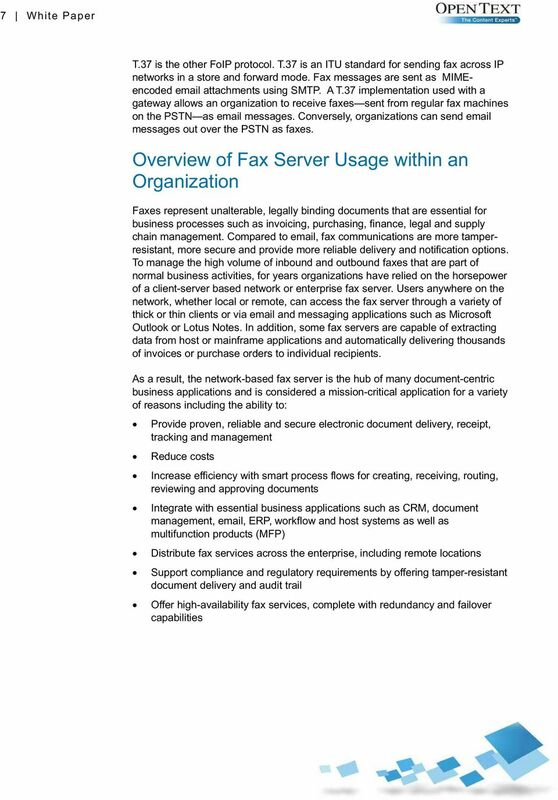 Some of the unique advantages of Open Text Fax Servers within an FoIP environment include its proven ability to: Integrate with a variety of mission-critical applications Provide reliable fax availability in a distributed environment Open Text provides extensive integration to office programs, document management, , ERP, workflow, MFPs and other applications used in ad hoc communications and business operations. It also partners with leading technology vendors including: IBM, Microsoft, Oracle, SAP, Canon, HP, Konica Minolta, Sharp, Xerox and more An Open Text Fax Server can securely send, receive and manage thousands of faxes a day generated from business applications in a timely, reliable and costeffective manner. The capacity of an Open Text Fax Server can be multiplied by combining two or more servers to share a common Open Text Fax Server database, no matter the location of the workers or offices. Open Text Fax Server can support offsite locations by distributing various server services that can run remotely. 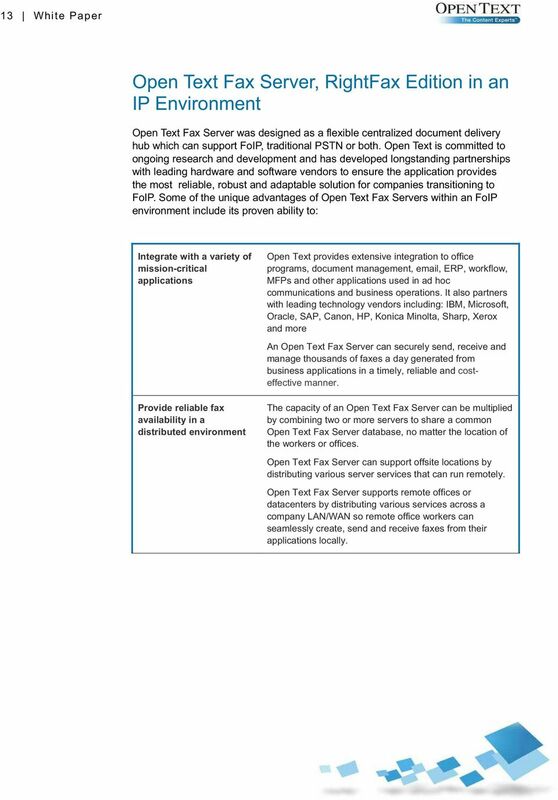 Open Text Fax Server supports remote offices or datacenters by distributing various services across a company LAN/WAN so remote office workers can seamlessly create, send and receive faxes from their applications locally. 14 14 White Paper Integrate with a variety of mission-critical applications Support for virtualization Open Text provides extensive integration to office programs, document management, , ERP, workflow, MFPs and other applications used in ad hoc communications and business operations. It also partners with leading technology vendors including: IBM, Microsoft, Oracle, SAP, Canon, HP, Konica Minolta, Sharp, Xerox and more An Open Text Fax Server can securely send, receive and manage thousands of faxes a day generated from business applications in a timely, reliable and costeffective manner. 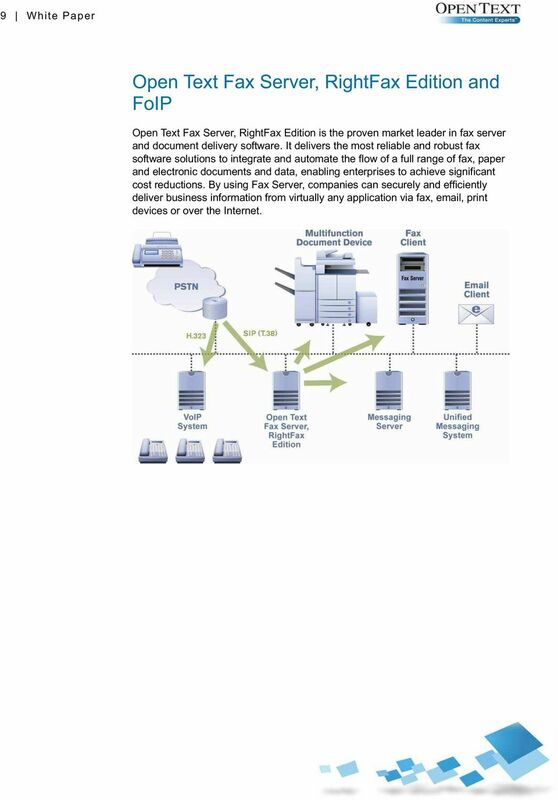 Open Text Fax Server, has an open, multi-layered architecture that deploys into virtualization scenarios in which it can run on virtualized machines, aiding in cost savings and streamlined management. 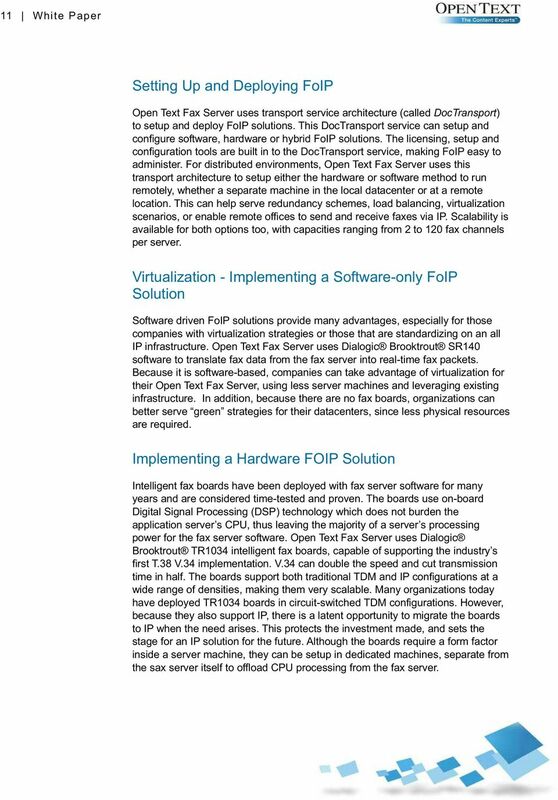 With virtualization and Open Text Fax Server organizations can gain numerous benefits and advantages including: Enhanced customer satisfaction and levels of service due to higher availability, failover scenarios, backups and security Reduced capital expenditures by eliminating the need for dedicated CPU hardware and fax boards Lower operating costs as a result of reducing rack space allotments in the datacenter and reduced energy consumption and utilization costs Increased IT administration efficiencies by centralizing management of all virtual applications. 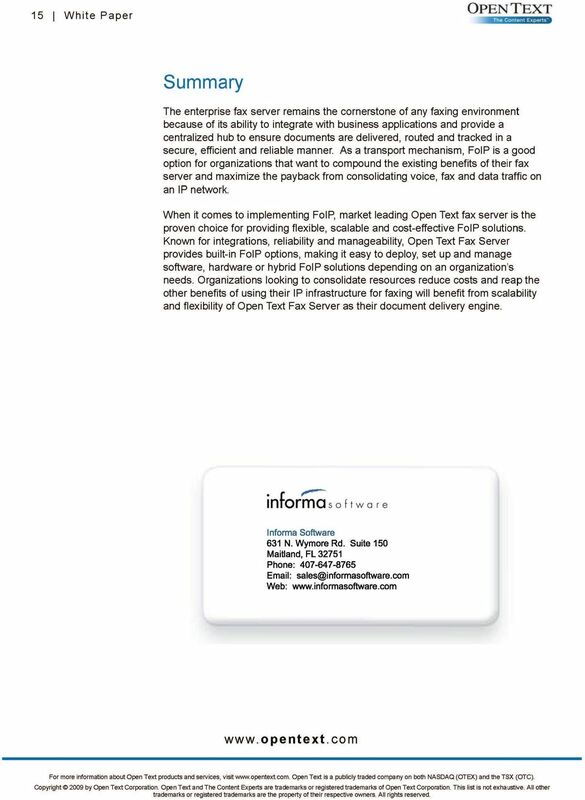 Proven fax server leader Open Text is the trusted market leader in fax server and FoIP with over 100,000 servers sold worldwide. Open Text is a financially sound, global company and the largest independent ECM vendor. Implementing Fax over IP in your Organization OpenText Business Network Once voice systems have migrated to Voice over IP (VoIP), fax communications are the next logical addition to an IP-based environment. 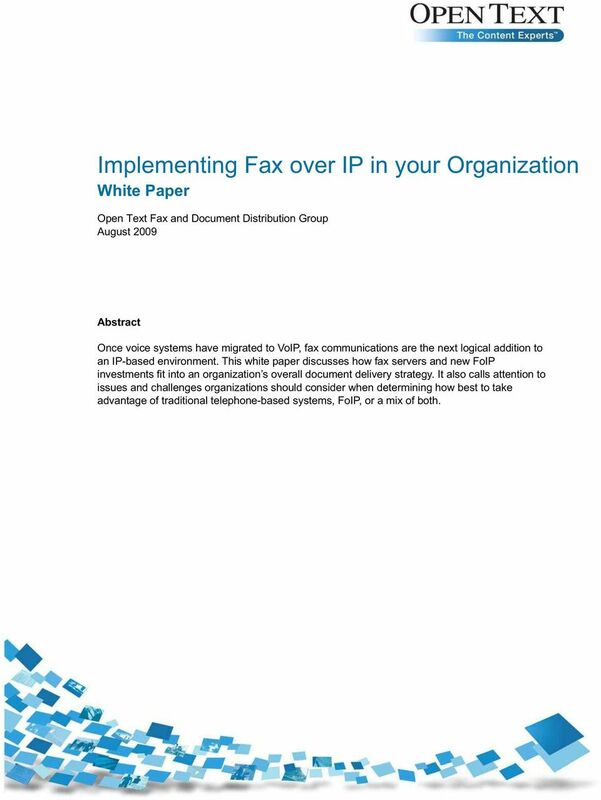 Fax over IP: What is the Right Way to Implement it for Your Organization? Fax over IP. What is the Right way to Implement it for Your Organization? Fax and the Future: A balanced overview of Fax over IP - where it delivers and where it doesn t.
ReplixFax Fax over IP (FoIP) Technical Overview and Benefits www.softlinx.com Table of Contents INTRODUCTION... 3 HOW FAX OVER IP (FOIP) WORKS... 3 FAX PROTOCOLS FOR FOIP... 3 TRADITIONAL FAX SERVER VS.
White Paper Fax Virtualization: The route to a centralised and consolidated fax environment A Lane Telecommunications Guide Page 1 The fax market is in a state of transition and has been for some time. Dialogic Brooktrout TR1034 Fax Boards The Dialogic Brooktrout TR1034 Fax Boards are high-performance, intelligent fax boards that offer TDM- (analog, DID, BRI, T1/PRI, E1/ PRI) and IP-based fax capabilities. VoIP and the SMBs - Tapping the Market By Matt Delpercio Despite the benefits of IP telephony, only a small percentage of small to medium businesses (SMBs) use VoIP as their primary means of voice communications. Microsoft Windows Server 2008 and Windows Server 2008 R2 Failover Clustering services are currently not supported. Upgrade or Replace? You want more from your call center software. But should you update your current system or opt for something new?